We are pleased to offer alloy wheel repairs for all makes of vehicle. Solving problems of leaking wheels due to paint corrosion and flat spots due to potholes etc. Our service ensures professional sealing and maintains the integrity of both wheels and tyres. Damage from potholes can result in flat spots in alloy wheels. We can remove these, saving the cost of a complete replacement. 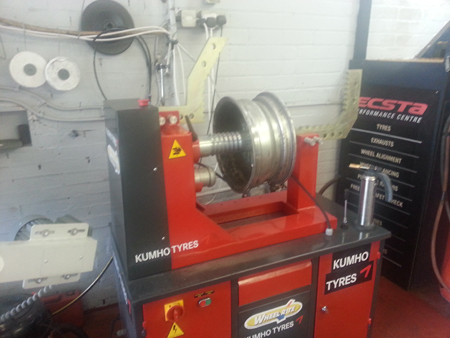 Flat Spots are gently removed using our hydraulic alloy wheel equipment. Wheel interiors are professionally WheelRite Pro machine buffed back to the alloy then re-coated resulting in a long lasting pressure seal. Copyright Linlithgow Tyres & Exhausts © 2014. All Rights Reserved.